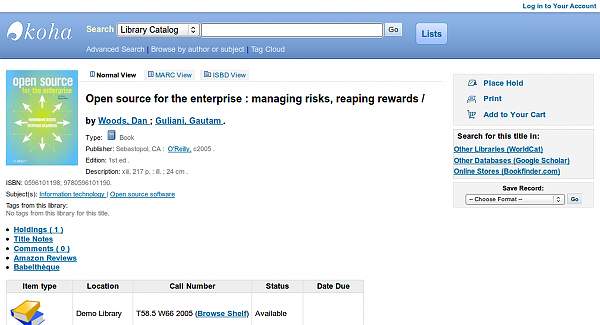 Contributed during 2005-2011 on the Open Source Integrated Library System (ILS), Koha. There were few libraries running Koha in 2005.
database system housing the prior ILS for importation into Koha, and began writing utilities in PHP to use with the new Koha system, since the Koha Perl code base was not yet fully open or available for the new system which used the Zebra search engine. Koha is now used in hundreds of libraries in the United States as well as at least hundreds more world wide.